Cylinder head porting is the technology of modifying the intake and exhaust ports of an internal combustion engine to improve the quality and quantity of the gas flow. Cylinder heads as manufactured cannot be optimal due to design and manufacturing constraints. Porting the heads provides the finely detailed attention required to bring the engine to the highest level of efficiency. More than any other single factor, porting technology is responsible for the high power output of modern engines. Daily human experience with air gives the impression that air is light and nearly non-existent as we move slowly through it. An engine running at high speed experiences a totally different substance. In that context, air can be thought of as thick, sticky, elastic, gooey and heavy. Pumping it is a major problem for engines running at speed. Porting helps engines deal with this problem. When a modification is decided upon through careful flow testing with an air flow bench, the ports are carefully reshaped with die grinders. Sometimes the ports must be welded up or similarly built up to put material where none existed. This illustration shows the difference between a poor performing port and an excellent design after porting modification. The difference between the two show the general idea of improving port flow. Higher and straighter is better. Shown here is a mold of the ports of a Ford 2-liter head destined for use in Formula 2000 racing. It is shown as manufactured with the intake port on the right and is badly in need of porting to alleviate the flow restrictions. Interestingly, this head received extensive flow bench development by Ford at design time but because of engine height restrictions, the use of cast iron and lack of knowledge at the time, this was the best that could be manufactured. Today, manufacturers are able to do much better although they still cannot approach the quality of hand made porting. The Ford 2-liter shown above in stock trim is capable of delivering 115 horsepower@5500RPM for a Brake Mean Effective Pressure (BMEP) of 140psi. Contrast this with the Pro Stock ports shown below. This GM Pro Stock head is capable of 1300 horsepower@8500RPM with a BMEP of 238psi. Since BMEP is an excellent efficiency measure and closely related to volumetric efficiency, this Pro Stock head is vastly better than the Ford. In fact a BMEP of 238 puts it at the top of the racing engine world. It is close to the limit for naturally aspirated gas burning engines. Of course cam characteristics and other things play a role in this difference as well but the difference in port design is a major factor. Parts of the port and their terminology. This photo is of port molds of a highly developed 500 cubic inch GM Pro Stock head. Note the height and straightness of the ports, particularly the exhaust port on the left. This design is based on a cylinder head casting, which is purpose-built just for Pro Stock applications. The head is supplied with small ports with plenty of meat everywhere for individual porting specialists to shape to their requirements without welding. Considering the flow through the intake port as a whole, the greatest loss must be downstream of the valve due to the lack of pressure recovery (or diffusion). This loss is unavoidable on intake ports due to the nature of the poppet valve. On the exhaust ports the opposite condition exists and we are able to control the geometry down stream of the highest speed section, namely the valve seat. This allows the possibility of good pressure recovery and is the reason exhaust ports flow better than intake ports of equal size do. Accepting the expansion into the cylinder loss as unavoidable, the rest of the port becomes that much more important. The areas which pass the most air at the highest speed for the longest time are the areas that are most important. The valve seat configuration on the port and on the valve together form one of the most critical areas in the port. The highest speed seen in the port will be at or near the valve seat for most if not the entire duration of the cycle. After that the throat area and short turn radius become critical at higher lifts in the middle of the cycle. The valve seat and valve head angles should be studied carefully in each design. The bowl area and the rest of the length of the port have important functions in controlling some of the dynamic behavior of the waves that traverse the system as well as setting up the air for a good entry to the throat. Shape, cross section, volume, cylinder swirl or tumble and surface finish are factors which must be considered in concert with the overall design of the rest of the engine and vehicle to achieve good results. Conversely the closing of the valve does not immediately stop flow at the runner entrance, which continues completely unaffected until the signal that the valve has closed reaches it. The closing valve causes a buildup of pressure which will travel up the runner as a positive wave. The runner entrance continues to flow at full speed, forcing the pressure to rise until the signal reaches the entrance. This very considerable pressure rise can be seen on the graph below. At the closing of the intake valve pressure rises far above atmospheric. It is this phenomenon that enables the so-called “ram tuning” to occur and it is what is being “tuned” by tuned intake and exhaust systems. The principal is the same as in the water hammer effect so well known to plumbers. The speed that the signal can travel is the speed of sound in the gas inside the runner. The boundary between the wave affected gas and unaffected gas could be compared to the event horizon of a black hole. This is why port/runner volumes are so important. The volumes of successive parts of the port/runner control the flow during all transient periods. That is any time a change occurs in the cylinder whether positive or negative. Such as when the piston reaches maxumum speed half way down the stroke. At first glance this wave travel might seem to be blindingly fast and not very significant but a few calculations shows the opposite is true. In an intake runner at room temperature the sonic speed is about 1100 feet per second and will traverse a 12 inch port/runner in 0.9 milliseconds. The engine using this system, running at 8500 RPM, takes a very considerable 46 crank degrees before any signal from the cylinder can reach the runner end. 46 degrees during which nothing but the volume of the port/runner supplies the demands of the cylinder. This not only applies to the initial signal but to any and every change in the pressure or vacuum developed in the cylinder. Why couldn’t we just use a shorter runner so the delay is not so great? The answer lies at the end of the cycle when that big long runner now continues to flow at full speed disregarding the rising pressure in the cylinder and providing pressure to the cylinder when it is needed most. The runner length also controls the timing of the returning waves and cannot be altered. A shorter runner would flow earlier but also would die earlier and return the positive waves much too quickly and those waves would be weaker. The key is to find the optimum balance of all the factors for the engine requirements. Further complicating the system is the fact that the piston dome, which is the source of the signal, continually moves. First moving down the cylinder, thus increasing the distance the signal must travel. Then moving back up at the end of the intake cycle when the valve is still open past BDC. The signals coming from the piston dome, after the initial runner flow has been established, must fight upstream against whatever velocity has been developed at that instant, further delaying the signal. The signals developed by the piston do not have a clean path up the runner either. Large portions of it will bounce off the rest of the combustion chamber and resonate inside the cylinder until an average pressure is reached. Then there are temperature variations due to the changing pressures and absorption from hot engine parts. These variations cause changes in the local sonic velocity. When the valve closes, it causes a pile up of gas giving rise to a strong positive wave which must travel up the runner. The wave activity in the port/runner does not stop but continues to reverberate for some time. When the valve next opens, the remaining waves influence the next cycle. This graph shows the pressure taken from the valve end (blue line) and the runner entrance(red line) of an engine with a 7inch port/runner and running at 4500 RPM. Highlighted are two waves, suction wave and valve closing wave, seen and the valve end and runner entrance showing the signal delay. The graph above shows the intake runner pressure over 720 crank degrees of an engine with a 7-inch intake port/runner running at 4500 RPM, which is it's torque peak (close to maximum cylinder filling and BMEP). The two pressure traces are taken from the valve end (blue) and the runner entrance (red). The blue line rises sharply as the intake valve closes and this causes a pile up of air which becomes a positive wave reflected back up the runner and the red line shows that wave arriving at the runner entrance later. Note how the suction wave during cylinder filling is delayed even more by having to fight upstream against the inrushing air and the fact that the piston is further down the bore, increasing the distance. The goal of tuning is to arrange the runners and valve timing so that there is a high-pressure wave in the port during the opening of the intake valve to get flow going quickly and then to have a second high pressure wave arrive just before valve closing in order to fill the cylinder as much as possible. The first wave will be what is left in the runner from the previous cycle while the second will primarily be one created during the current cycle by the suction wave changing sign at the runner entrance and arriving back at the valve in time for valve closing. The factors involved are often contradictory and requires a careful balancing act to work. When it does work, it is possible to see volumetric efficiencies of 140%, similar to that of a decent supercharger. It is popularly held that enlarging the ports to the maximum possible size and applying a mirror finish is what porting is. However that is not so. Some ports may be enlarged to their maximum possible size (in keeping with the highest level of aerodynamic efficiency) but those engines are highly developed very high speed units where the actual size of the ports has become a restriction. Often the size of the port is reduced to increase power. A mirror finish of the port does not provide the increase that intuition would suggest. In fact, within intake systems, the surface is usually deliberately textured to a degree of uniform roughness to encourage fuel deposited on the port walls to evaporate quickly. A rough surface on selected areas of the port may also alter flow by energizing the boundary layer, which can alter the flow path noticeably, possibly increasing flow. This is similar to what the dimples on a golf ball do. Flow bench testing shows that the difference between a mirror finished port and a rough textured port is typically less than 1%. The difference between a smooth to the touch port and an optically mirrored surface is not measurable by ordinary means. Exhaust ports may be smooth finished because of the dry gas flow but an optical finish is wasted effort and money. The reason that polished ports are not advantageous from a flow standpoint is that at the interface between the metal wall and the air, the air speed is ZERO. This is due to the wetting action of the air and indeed all fluids. The first layer of molecules adheres to the wall and does not move significantly. The rest of the flow field must shear past which develops a velocity profile (or gradient) across the duct. In order for surface roughness to impact flow appreciably, the high spots must be high enough to protrude into the faster moving air toward the center. Only a very rough surface does this. Scavenging quality/purity: The ports are responsible for sweeping as much exhaust out of the cylinder as possible and refilling it with as much fresh mixture as possible. This takes careful and subtle aiming of all the transfer ports. Power band width:Since two-strokes are very dependent on wave dynamics, their power bands tend to be narrow. While struggling to get maximum power, care must always be taken to ensure that the power profile does not get too peaky and hard to control. Time area: Two-stroke port duration is often expressed as a function of time/area. This integrates the continually changing open port area with the duration. Wider ports increase time/area without increasing duration while higher ports increase both. Timing: In addition to time area, the relationship between all the port timings strongly determine the power characteristics of the engine. 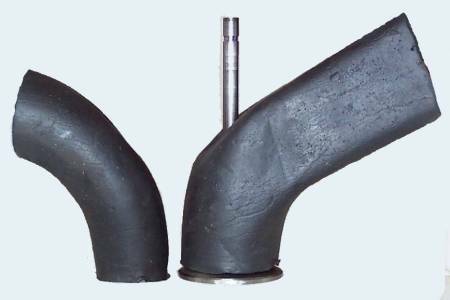 Wave Dynamic considerations: Although four-strokes have this problem, two-strokes rely much more heavily on wave action in the intake and exhaust systems. The two-stroke port design has strong effects on the wave timing and strength. Heat flow: The flow of heat in the engine is heavily dependent on the porting layout. Cooling passages must be routed around ports. Every effort must be made to keep the incoming charge from heating up but at the same time many parts are cooled primarily by that incoming fuel/air mixture. When ports take up too much space on the cylinder wall, the ability of the piston to transfer its heat through the walls to the coolant is hampered. As ports get more radical, some areas of the cylinder get thinner which can then overheat. Piston ring durability: A piston ring must ride on the cylinder wall smoothly with good contact to avoid mechanical stress and to cool the piston. In radical port designs the ring barely touches anywhere at all in the lower stroke area. These areas can suffer extra wear due to the minimal contact and the mechanical shocks during transition from partial to full cylinder contact shorten the life of the ring considerably. Very wide ports allow the ring to bulge out into the port, exacerbating the problem. Piston skirt durability: The piston must also contact the wall for cooling purposes but also must transfer the side thrust of the power stroke. Ports must be designed so that the piston can transfer these forces and heat to the cylinder wall while minimizing flex and shock to the piston. Engine configuration: Engine configuration can be influenced by port design. This is primarily a factor in multi-cylinder engines. Engine width can be excessive for even two cylinder engines of certain designs. Rotary disk valve engines with wide sweeping transfers can be so wide as to be impractical as a parallel twin. The V-twin and fore-and-aft engine designs are used to control overall width. Cylinder distortion: Engine sealing ability, cylinder, piston and piston ring life all depend on reliable contact between cylinder and piston/piston ring. Cylinder distortion reduces power and engine life. This distortion can be cause by uneven heating, local cylinder weakness or mechanical stresses. Exhaust ports that have long passages in the cylinder casting input lots of heat on one side of the cylinder while on the other side the cool intake may be cooling the opposite side. The thermal distortion resulting from the uneven expansion reduces both power and durability. Careful design can minimize the problem. Combustion turbulence: The turbulence remaining in the cylinder after transfer persists into the combustion phase to help burning speed. Unfortunately good scavenging flow is slower and less turbulent. The die grinder is the stock and trade of the head porter. They are used with a variety of carbide cutters, grinding wheels and abrasive cartridges. The complex and sensitive shapes required in porting necessitate a good degree of artistic skill with a hand tool. In addition, CNC machining is used to provide the basic shape of the port but hand finishing is usually still required because some areas of the port are not accessible to a CNC tool and the desired surface finish may not be possible with CNC alone. CNC milling can eliminate the tedious job of removing the bulk of unneeded material, leaving only the final finishing for hand tools, as well as providing much needed and accurate reference points for that same hand finishing, greatly speeding the job. Measurement of the interior of the ports is difficult but must be done accurately. Sheet metal templates are made up, taking the shape from an experimental port, for both cross-sectional and lengthwise shape. Inserted in the port these templates are then used as a guide for shaping the final port. Even a slight error might cause a loss in flow, so measurement must be as accurate as possible. The internal aerodynamics involved in porting is counterintuitive and complex and absolutely requires an air flow bench, a thorough knowledge of the principals and use of engine simulation software in order to determine what needs to be done to optimize a port. Although a large portion of porting knowledge has been accumulated by individuals using cut and try methods over time, the tools and knowledge now exists to develop a porting design with a measure of certainty. Porting “willi nilli” without full understanding still continues but the results are spotty and the process is expensive and time consuming with many more failures than successes.